When I was growing up, we had an Italian prune plum tree in our backyard. My mom also had an heirloom recipe for pflaumekuchen, a German plum cake which called for just this sort of plum and which had been passed down by my paternal great-grandmother who immigrated to American from Germany. We had only a few culinary traditions in my family, and autumnal pflaumekuchen was one of them. So when I saw prune plums the other day, I was reminded that we're right in the midst of their relatively short season. I've made my family's recipe before, but was wondering what other versions were out there. I turned to a couple of german cookbooks I have to look for other options and found another version, called zwetschgenkucken. Now, I'm notorious for my struggle with the German language, but handy enough with a dictionary to discover that zwetschge means, quite specifically, Italian prune plum, whereas pflaume is the more general word for plum. In The New German Cookbook, Jean Anderson and Hedy Würz maintain that "what we would call a tart or open-face pie, Germans often call a cake." The recipe they give is indeed made with a baking powder pastry pressed into a tart pan, and originates from the historical Swabian region of Germany which now includes parts of present-day France and Switzerland. My family's recipe is not so much a crust, it's a bit more cake-like, although the dough is spread rather thinly. My family's kuchen is spread in a 9x13" pan, the batter so moist from a full stick of butter and 1/4 cup shortening (presumably this would have been lard in the kuchen's original incarnation in Germany), and heavy from the plums, that only small pieces were ever cut. More often than not, the pan just sat on the counter, waiting for us to walk by and furtively sneak small tastes until it was gone. Since the family recipe is normally my mother's domain, I decided to try one of the variations I'd come across, although I didn't want to stray too far from what I was used to. That means my thin dough would be covered only by plums, not by any custards or additional ingredients I'd seen given as other options. This recipe comes from The New German Cookbook by Jean Anderson (a James Beard Hall of Famer) and Hedy Würz, and they call it a Zwetschgenkuchen. Oven preheated to 350, grease the tart pan. For the pastry: cream the butter in a standing mixer at high speed for 2-3 minutes, until light and fluffy. Add the sugar, 1 tablespoon at a time. Beat 2-3 minutes longer. By hand, mix in the flour, baking posder, and salt. Then add the milk. Stir after each addition only enough to combine. Press the crust into the pan (bottom and sides), and brush with the egg glaze. 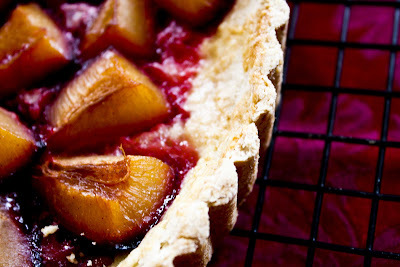 For the filling: Scatter the bread crumbs over the bottom of the tart if your plums are particularly juicy (I didn't need to include this step). 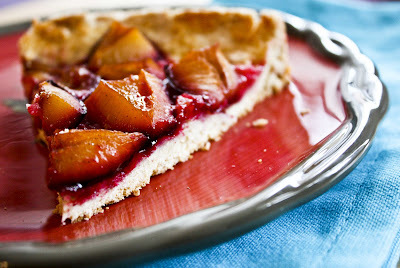 Arrange the plums on the crust, skin side down and sprinkle with the cinnamon/sugar. 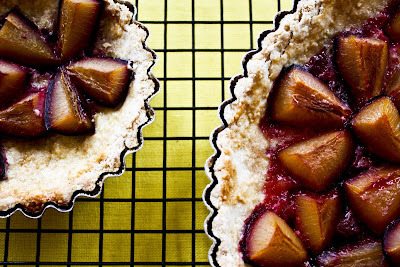 Place the tart on a baking sheet and position it in the lower 1/3 of the oven. Bake for 40-45 minutes until the pastry is brown and the filling bubbly. If your oven is insane like mine, and only heats in some spots, you might consider rotating the pan halfway through baking. Cool in the pan on a wire rack before serving. This was good. 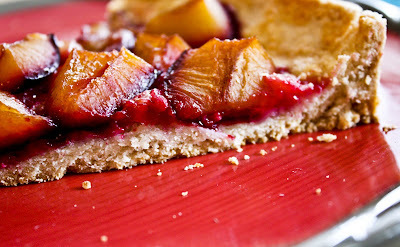 The plums were nice and tart (perfect for me, too much for the fiance) and the crust was subtle and crumbly. Not earth-shattering, but certainly edible. However, next time, I think I'll return to the old family version. After all, there's a reason it became a tradition. Also, I'm sending the lead picture in to Jugalbandi for the monthly Click event. This month's theme is crust! 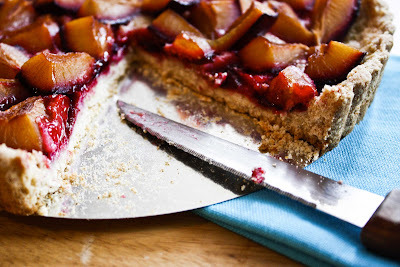 This is a beautiful plum cake! Do you know if there are any pflaumekuchen recipes out there that are more similar to your family's? Hi Andrea, thanks for sharing your family's recipe with me! It's an honor. :) You can reach me at reginapchan [at] gmail [dot] com. It's Pflaumkuchen/Zwetschgenkuchen or better Zwetschgendatschi the Bavarian way. I warned you about my struggle with the German language! Thanks for the correction. What a gorgeous dessert! I love the color of those plums. 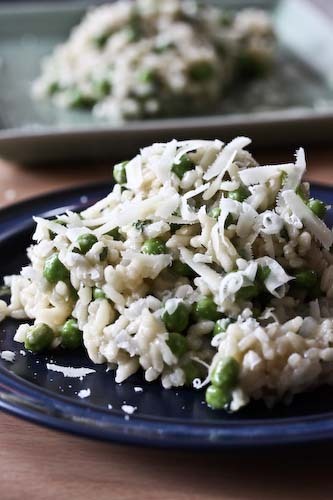 And I love that you used a new recipe while keeping it close to what you grew up with! I'm from Bavaria/Germany, and here we say Pflaumenkuchen or Zwetschgendatschi (with yeast-dough). Basically Pflaumen and Zwetschgen are two kinds of fruit, even if they taste similar: Pflaumen are round and tend to be rather soggy. Zwetschgen on the other hand are egg-shaped and better to bake with as they are firmer. My mother came from Bavaria and this was one of her signature desserts that has been passed down to me. We all it "Zwetscgen Datschi". This is almost how we make it. We don't use the bread crumbs and I add a little vanilla sugar to the dough. Other than that, I use only Italian prunes, melted butter and cinnamon sugar. Sometimes, I spread a very thin layer of either fig jam or apricot jam on the crust. We don't get these prunes until the Fall and I cannot wait to make it. You might want to check out my Apricot Kuchen that I blogged about a couple weeks ago! Great recipe! I was excited to come across this recipe on Pinterest. My father's parents were from Germany and my dad taught my mom (from Utah) how to make a version of the pflaumekuchen. I never knew how to spell it (we called it flauma-kooka), but I LOVE it and have tried to make my version from time to time. 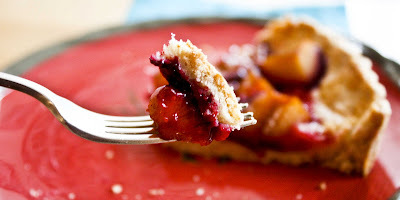 Mom settled on a bisquick dough crust pressed into a pie tin with the quartered plums arranged in a circular pattern from the center out to the edge. It looked as beautiful as it was delicious. I look forward to trying your recipe. Thanks.